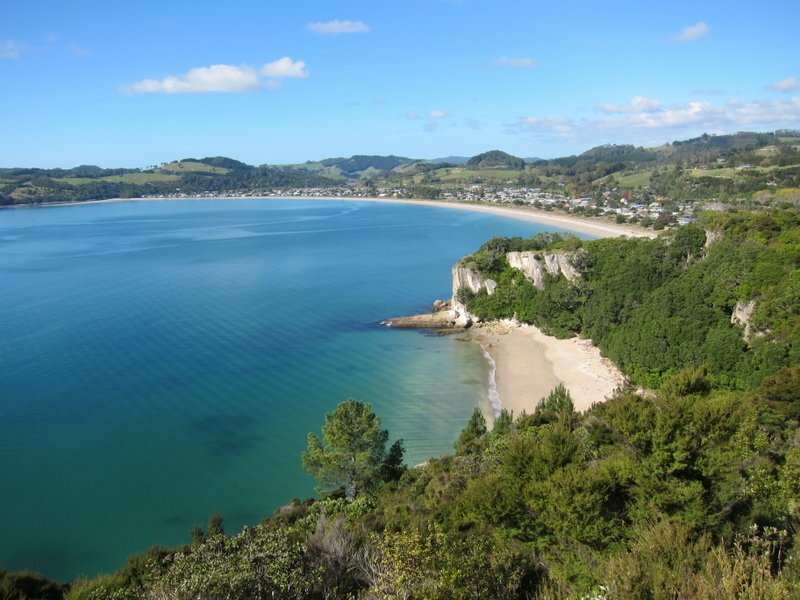 We’ve just returned from a five-day visit to the Coromandel Peninsula and Mercury Bay. 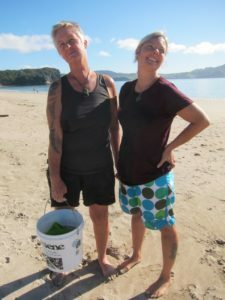 We had two reasons for going at this time: to go to the one-off Moana Maniapoto Concert in Coromandel Township, and to link up there with our friend and former gardener Sue and her partner Susie for a late summer holiday with them at Cooks Beach. We had four days of absolutely calm, sunny autumn weather. 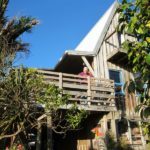 Our first two nights were based in the colourful and comfortable Tree House at Fern Lodge, in Coromandel, surrounded by bush and bird song. Then we had two days exploring some of the east coast of the Peninsula and Mercury Bay from a 60-year-old beach-side bach belonging to Sue’s family. Sue and Susie with tuatua, practising their ultra-fem head-tilting. Exploring the area with Sue, who has spent a lot of time with family members in the area over the years, and appreciating her stories, as well as our walks and swims at Cooks Beach – and the delicious tuatua the two Sues dug and cooked for us- was a special delight. We stopped at Kuaotunu, Otama Beach, Flaxmill Bay, Front Beach, and enjoyed the breathtaking views from Maramaratotara (Shakespeare Cliff). We’re reminded what a beautiful coast this is, and how lucky we are as nation to have these amazing beaches so near the urban centres of Auckland and Hamilton. We were also aware at every bend in the road of the 600-year Ngaati Hei history of the area before Pakeha settlement. Many beautifully shaped pa sites are still visible, even though rampant housing subdivisions are stretching along the coast and creeping up hillsides. Ngaati Hei have managed to get some signs put up which acknowledge Maori presence, but there is room for a great deal more if we are to understand the history and honour the land and water fully. Hopefully the Coromandel Council is currently negotiating with Ngaati Hei to ensure a much more comprehensive telling of the old stories. Hauraki Gulf: Tīkapa Moana (an allusion to ceremonies designed to protect Tainui and Te Arawa tribes, which took place at a small island off Cape Colville known as Tīkapa or Takapū, which means gannet). Acknowledging Maori history enriches our nation. Hopefully, too, the Council is about to rein in development and provide proper drainage treatment, bush and coast protection, or we’ll lose the beauty- and much of the coast. Already, after heavy rain, there are major issues with huge slips on the coastal road all the way from Kawakawa Bay to Coromandel.